"Please don't take this the wrong way, but you're so weird," she says. I look at her, or at least her chin, and discover that an offhand comment by Kit can disrupt my respiration. "But good weird, you know?" Good weird is what I've been telling myself I am for years, when being just plain weird was too much of a burdern to carry. Good weird is the only solution to the problem, when normal isn't a viable option. Good weird may very well be the opposite of cool, but I've never aspired to cool. At least, not the version I'm familiar with. "Speaking of weird, I have a random question for you. What can you tell me about quantum mechanics?" Kit asks, and a shiver makes its way from the bottom of my spine all the way to the top. My sister suggested that I think up some small-talk ideas in case Kit came back to my table today. It's almost enough to make me reconsider the entire concept of fate. - excerpt from book. 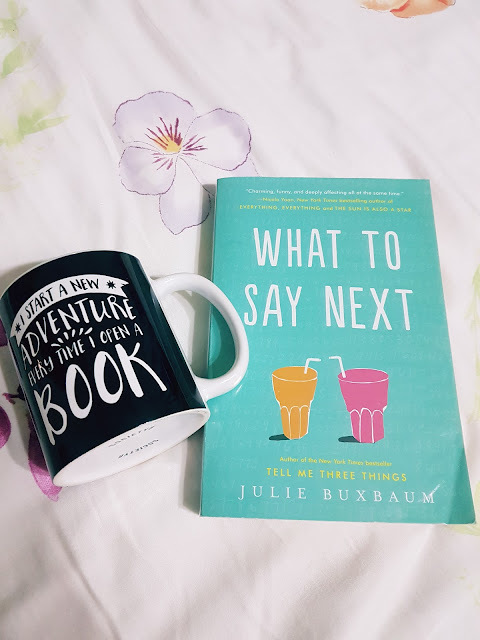 What To Say Next by Julie Buxbaum is about two people who are not in the same click in high school but starts to interact with each other. A traumatising incident caused the popular girl Kit to suddenly sit at David's table. It's definitely something that has never happened to David as he eats alone all the time. He rather have the quietness than to be bothered but why did Kit sat with him. I like how the author emphasise on biracial as it's not a topic often talked about, especially for those who are in America as from where I am it's quite common but there are always issues involved. I'm pretty sure it's the typical ones such as cultural differences, religious practises and principles while growing up. For someone like Kit who is half and half it's quite hard to get the correct footing as people would ask that question of "so what race are you". I find it quite rude but then again children are innocent because they don't understand how it impacts the person asked. That is just part of the important topic, another one would be a socially awkward child and how he fits in high school. I find David's perspective to be interesting to read when he is all alone thinking about his peers, how he views them and how his sisters gives him warning about those people. Of course all those socially awkward people are not entirely the same but they do go through the same struggles, trying to either fit in or be invisible. Of course we will never see the end of the "normal" people judging them and the extreme ones will bully. When those two interact, what are the conversations and activities that they partake, how they feel about each other are parts that enhances their personalities. I totally loved how the author manage to make the story flow without boring the readers, everything was light and easy yet a heavy message was subtlety told. Having a simple plot yet giving it life through the emotions and reactions of the characters made you feel closer to them. Lastly, how they grow directed the book to its plot twists. A good page turner, this thin book packs a punch to your emotions and leaves quite an impression. For all those contemporary young adult lovers, this is one book you should not miss. I have heard that the author's debut was good, so after reading this I am convinced to pick up that other book. Well written review. It seems that this is a captivating young adult book, well I love this genre. Thank you for stopping by. Yes this book truly talks about the most common human struggles but yet it's a battle that is hard to fight even is we acknowledge it.